Harm none, and be ready for zombies. In the little town of Brighton, Amelia's practice of Wicca has always marked her as odd. But Amelia can't change what she is. Knowing how to see auras, heal, and create spells comes naturally to her. Only Madame Knightly, the ancient matriarch and owner of Witch Wood Estate to whom Amelia plays caretaker, doesn't seem to mind her conjoining. In fact, the crumbling old mansion is full oddities. When modern treatments fail to make a dent in the flu outbreak sweeping the globe, those who once ridiculed her white witchcraft turn to Amelia for help. While her eucalyptus tinctures prove no more effective than Western medicine, her spell-casting is another matter. The residents of Brighton soon depend on the very magic they once ridiculed to save their lives. Loved this edition!! Amelia was amazing. She lives in Brighton and practices Wicca but is kind of shunned by others for it. Amelia has always been different, she sees auras, and she loves going to Witch Wood Estate and helping Madame Knightly. She is at the estate when her mother rings her and tells her to stay there as she has caught the flu that is going around. Little does she know that it's the beginning of the end! Amelia was such an amazing character. She is strong, capable, brave, sure in herself and all round amazing, She is able to heal people with her touch so will be called upon to use her powers soon. The setting of this edition was stunning. An old estate that has been magically fortified. It is the type of place that would be amazing to visit (if there were no Zombies, shifters etc there!!!) The library sounded stunning!! Kristin James again nails it. Despite most of the main characters being female, it is easy to follow which is talking at any given time. Loved her as Amelia and she is by far my favourite of the characters so far. A little taste of witch magic in a zombie world. 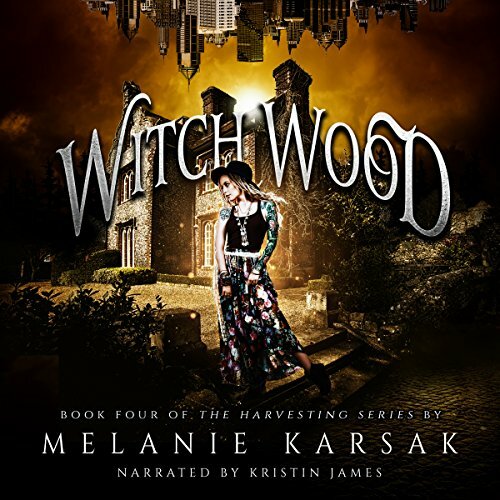 Witch Wood is the latest novella in The Harvesting series, which once again focuses on the introduction of a new set of characters and sets up the story for the next full length novel. The entire concept of introducing characters in their own novellas is one seriously awesome way to let them shine on their own before they meet the main cast and things get even more crazy. Amelia is a young woman, high school aged, with the innate ability for magic. She’s a practicing Wiccan, who focuses on the positives around her to heal and provide. She’s confident, strong willed, and caring; and I can already see how well she’ll balance out the eventual trifecta of strong women in the overall series. At this point I’d be more shocked if Karsak created a main character who I didn’t like almost immediately. That being said, she’s damn good at making side characters who can ruffle feathers or do outright evil. Witch Wood Estate seems like one really beautiful and mysterious place, and I’m really excited to see how it will play into the future novel. In my mind it’s a small more enclosed Baltimore, with grounds full of crops and vines and an almost protective air to it’s shadow. At this point I’m not sure what I can say about Kristen James’ narration work that I haven’t already, but I will say she gets better with each one. She has a true talent and you can tell just how much she cares for her craft in the attention to making the characters sound different and infusing as much life and emotion into her reading. I’m sad that I have to wait for the next book, but I’m super excited to see how the series will end. I definitely can’t wait to see how Amelia meshes with Cricket and Layla, and how the groups find their new setting. Would you consider the audio edition of Witch Wood to be better than the print version? ALWAYS IS!!! But I only listened! I liked this whole story!!! I wish it would have been longer! Which character – as performed by Kristin James – was your favorite? This series would make a cool movie! I loved this short story!! I really love this series too...this was actually my fave so far....Amelia is a great character and I can not wait to see how this ties in with Layla and Crickets group....I highly recommend this book for anyone who has read the series, or even a a stand alone!!! Previously, I read Melanie Karsak's Midway and liked it. I liked it so much, I went out and bought The Harvesting (first book in the series), but I haven't listened to it yet because I've been trying to attack my TBR pile. After I had a chance to listen to Witch Wood for free, I eagerly jumped at it and moved it to the front of the line. Karsak is very good at delivering an atmospheric short story about zombies that doesn't mention the Z word. With this and Midway, she writes about people who may be unusual on the fringe of the infection. They may not even realize the monsters are zombies, but before too long the monsters, whatever they are, are real. The heroine of this story is Amelia, a teenage witch. We start in class, which is a great way to show her with her peers. Then we get scenes at home with her mom and step-dad and then at work with the eccentric old lady she helps. All of these establish the setting and the character. Amelia herself is kind and naturally magically gifted. She has both friends and foes, yet she holds her head up high no matter how some cretins disrespect her. When things turn bad, she deals with it using the tools she has--her magical gifts. To the curious reader, yes, this story does stand alone. Since the nature of the epidemic isn't explicitly mentioned, you miss nothing. You're also given enough to care about the character and her struggles. Because this is a novella, the story moves quickly, and sometimes that's all a person wants out of a story. You get some interesting information about witches and Wicca, and there are some good fright scenes are our heroine tries to get her people to safety. If I had one criticism of the writing, it would be this: sometimes Amelia sounds too mature for her years. I understand that she's mature for a teenager, but it's more than just that. The author delivered a lot of well-researched information through Amelia. It was definitely interesting, but during one passage I had a mental disconnect because a teen character, even a very intelligent one, would probably not talk like that. Thankfully, she never once sounds condescending when she is delivering information this way. As for the narrator's performance: She's very good! She makes each character sound different. The dumb jock sounds male. The frail old lady sounds it. Amelia's mother sounds like a tired nurse. The teen girls each sound different. It is a very good narration that by the nature of its competence is immersive. As far as I know, this is only the 2nd book I've heard narrated by Kristin James, but I would be confident in picking others that she has performed. I eagerly look forward to listening to Harvesting, the original series novel, and The Shadow Aspect. The author promises a 3rd Harvesting novel in 2016, and I’ll probably listen to that, too. Disclaimer: This audiobook was provided by the author, narrator, or publisher at no cost in exchange for an unbiased review courtesy of Audiobook Blast. What made the experience of listening to Witch Wood the most enjoyable? Kristin gets to share her adverse vocal talents once again. She not only does different tones for different characters, but also gets to do a young girls voice then the teachers older and more stern voice. There is such a variety that it's amazing to see her slip into different personas. Kristin does a hurt, upset girl along with other voices. I enjoy the combination of Kristin's vocal acting and Melanie's writing that brings new elements to the world with each story. As with each book, this one brings a new element into the world of the harvesting. Magic. A witch. I couldn't quit listening. I knew what was going to result, but I was drawn to know for sure. What would happen and see what Amelia could do. She's special! Oh we discover with Amelia something new that she can do. Kristin is a voice talent to listen to. This story ranks up at the top with her works. She does different voices, personalities, and accents for the characters. She feels as she lives the emotions for us to hear. I felt for Amelia in the end. She has losses that hurt, but in the end there was one that was hard. But then the very end had me excited and ready for the next book! Amelia is a white witch. It's sweet hearing her thank the trees and for pumpkins and many others. She's connected to nature. She even sees the aura of people, and tries to help all when sees dark spots by clearing them from their aura. She believes in using natural herbs to help heal and maintain good health. This mention of natural herbs brings into question something that's mentioned in Shadow Aspect, something that might have spread this disease. Oh where this story ends! Eee! I can't wait to follow on in the series. It's all coming together now. And I'm curious about Logan. I have a few thoughts on him, but I'll keep that to myself so you can experience him in your own thinking. Great story and wonderful narration! I can't say enough good things about this series. You really have to read it, I promise you'll love it. It has everything but in a great way! Zombies, witches, vampires, fae people. I don't know how you mix all of that & come up with something so brilliant but it works! In Witch Wood, we meet Amelia. She will soon join up with the rest of the characters in the Harvesting series. Amelia has some abilities of her own. I wonder about the next book in the series if all these people with abilities come together to try to help get rid of the Zombies once and for all. I won't know until I read on. This series has everything you can imagine in it. All kinds of great characters and supernatural characters, anything you can think of I believe are all in the pages of these books and this series. I enjoy this series very much. I am not much into zombies but this series has soo much more and keeps me coming back until the end. I can't wait to see what happens next. "This book was given to me for free at my request and I provided this voluntary review." love how the series is coming together!! I love these individual stories that ties everything together… The narrator does an amazing job and again I love the imagery of the book… I am excited to hear the next one!!! I received this book for a unbiased review. IS OH HOW I WISH THIS BOOK WAS LONGER!! I REALLY GET INTO BOOKS SO THAT IS MY ONLY COMPLAINT!! IF YOU PAYING CASH THAT IS GREAT BUT DON'T USE A CREDIT... NOT THAT IT'S NOT CREDIT WORTHY, JUST THAT I REALLY WISH IT WAS LONGER! !